Miami has been chosen to host a record 10th NFL showpiece match in 2010. Houston and Atlanta were also in the runnning for Super Bowl XXXXIV which had been conditionally awarded to New York when it was a 2012 Olympic bidder. But funding plans for a new stadium in Manhattan were rejected by politicians, ending the city's 2012 Games hopes. Miami will also stage the 2007 Super Bowl - its ninth NFL showpiece game, tying it with New Orleans for the most staged by one city. 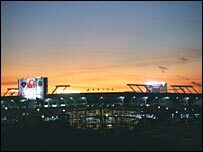 The three finalists were chosen because they had lost in bidding for the 2009 Super Bowl that in May was awarded to Tampa Bay, Florida. The 2006 Super Bowl will be staged indoors at Detroit's domed stadium Ford Field in the middle of the harsh Michigan winter. Phoenix will host the 2008 Super Bowl.